In manufacturing, the technology and processes you use directly impact your bottom line and your ability to evolve. To succeed in today’s fast-moving marketplace, you must have the foresight to see what’s coming and the flexibility, resources, and tools necessary to respond to unexpected challenges in the most effective and efficient way. As supply chains grow increasingly more complex, many manufacturers are opting to make the switch to a cloud spend management solutions that can help them manage indirect and direct sourcing, inventory, resources, and contracts with greater ease. But truly driving change in your organization requires more than purchasing the latest tool. It’s all too easy to focus on specific tech features and lose sight of whether or not those features are designed to help your team to optimize their sourcing, planning, and decision-making processes. The supply chain experts at RiseNow have experience working with manufacturers to align people, processes, and technology in a way that will drive change and enable continued growth. We’ll work to understand your organization’s unique needs and challenges, identify gaps in your current processes, and determine what tools and functionality are required to transform the way your staff operates and makes sourcing and planning decisions. By implementing, configuring, and optimizing your technology in a way that encourages adoption and promotes adherence to supply chain best practices, we’ll help you create a foundation for long-term growth. 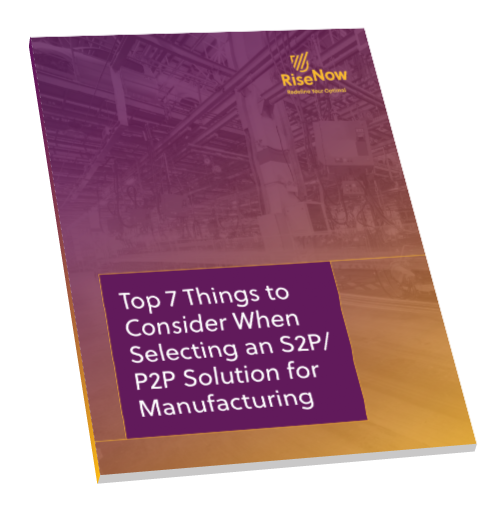 Keep these seven considerations in mind when selecting the right S2P or P2P solution to meet your needs.